Definitions and examples of Doppler Ultrasounds are presented in two views. Doppler is a specific type of ultrasound that measures the speed and direction of blood cells as they move through a body’s vessels - including the major arteries and veins in the abdomen, arms, legs and neck. The movement of these blood cells causes a change in pitch of the sound waves that are echoing back. This is referred to as the Doppler effect. Doppler images can help the physician view and evaluate blockages to blood flow or clots as well as the narrowing of vessels which may be caused by plaque. It also has the ability to show various tumors and congenital malformations. It is often included as part of the other types of ultrasound exams. Color Doppler uses a computer to convert Doppler measurements into different colors to better visualize the speed and direction of blood flow. Red often being used for flow towards the transducer, blue for flow going away. This use of color flow mapping can dramatically show the flow of blood in a real time. Color doppler is very useful in the diagnosis of fetal cardiac and blood vessel defects, and in the assessment of the hemodynamic responses to fetal hypoxia and anemia. Spectral Doppler displays blood flow measurements graphically, in terms of the distance traveled per unit of time, instead of displaying Doppler measurements visually. It is often used in the diagnosis of vascular diseases and in detection of the fetal heartbeat or of the velocity of movement of a beating heart. Duplex Doppler is a type of image display in which both color flow and spectral images are seen at the exact same time. Power Doppler (Doppler angiography) is a technique that is even more sensitive than color Doppler. Power Doppler uses amplitude information from doppler signals rather than the flow velocity information to visualize slow flow in smaller blood vessels. 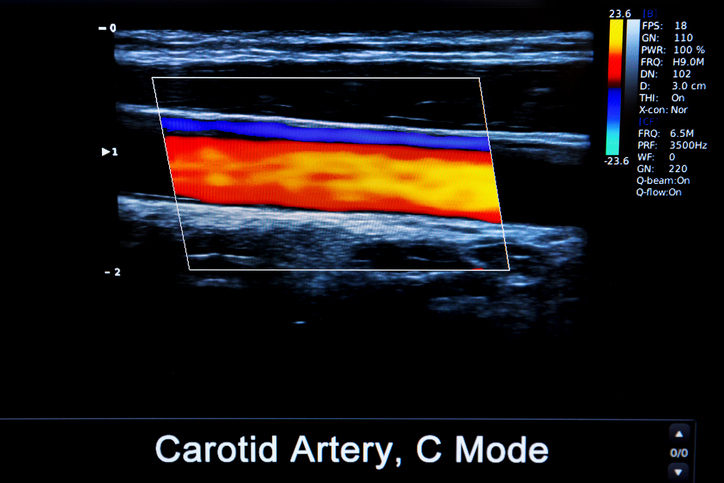 This data makes the technique capable of providing a greater detail of blood flow and is now used when blood flow is little or minimal. Power Doppler, however, does not help the radiologist determine the direction of blood flow. Continuous Wave Doppler is where the transducer emits and receives the ultrasound beam continuously, which may be optimal for the measurement of high velocity flow, such as blood traveling through heart valve stenoses. Pulse Wave Doppler simply means the transducer is sending out ultrasound in pulses. Developments in Doppler technology have enabled growth of using it in Obstetrics, particularly in the area of assessing and monitoring the well-being of the fetus, its progression in the face of intrauterine growth restriction, and the diagnosis of cardiac malformations. Doppler is often used in fetal heart rate detectors. Above: Doppler ultrasounds can measure the conditions, including blood flow, of the arteries.